BigCommerce themes especially Stencil based themes may be the best choice for you if you are considering starting your own online store that helps reach out global market and spread your products worldwide. As technology improves when it comes to an outstanding savvy platform called BigCommerce that allows you to create a thriving online store no matter if you're a novice or an old hand. BigCommerce is an easy-to-start, flexible e-commerce platform that provides you all the features you need to build an easy to manage and affordable online web store. It comes with advance integrated multi-channel selling options allows you to link up with other marketplaces to sell your stuffs from a single location including Facebook, Instagram, Pinterest, eBay, Amazon and Square POS. Since it features a cloud-hosted platform, you can possibly to create a fully-fledged ecommerce store without having to search for a hosting provider nor stumbled with any technical knowledge. For what it's worth, there are ample of inbuilt BigCommerce Themes available within our showcase offering an unlimited selection as per your wish. Whether your business involves in electronics, gaming, jewelry, fashion or tech-related products, there is an enormous collections of beautiful, feature-rich themes to work with. Our BigCommerce Templates are crafted with Stencil Framework - a flexible and powerful theming engine - offering a lightweight yet superb robust, real-time performance, first-class experience for your customers. It incorporates many innovative BigCommerce built-in features, allows users to alter their store with ease requires zero snippet of code. With our Responsive BigCommerce Themes, 24/7 technical support, infinite customizing features, and integrations – you can set up a standout store that will keep pace with growing businesses. Beyond Responsive BigCommerce Themes: We created with care to make sure every template resizes intuitively to any devices so that your products reach out to maximum number of users. Various Layout Variants: Bundles in a ton of inbuilt layouts allowing you to build a page within no time. Fast Loading Speed: With tremendous experience in BigCommerce, our developers expertly conceived with optimizing theme's code structure that helps minimize loading time in an eye-blink. Extensive Customizing Possibilities: Various of theme options come handy that you can transform whatever you can imagine from colors, fonts, menu, slideshows and beyond the limits of customization. Intuitive Interface: Our design junkies love creating fresh and clean, modern, pixel perfect templates. A gorgeous-look interface offering a superb browsing experience that helps you immediately catch your customers' hearts and purchase your products over and over again. Powerful theme options: With advanced theme options panel, you can customize any aspect of your site quickly and easily. It couldn't be easier to the theme's look by selecting a layout style with one single mouse click. 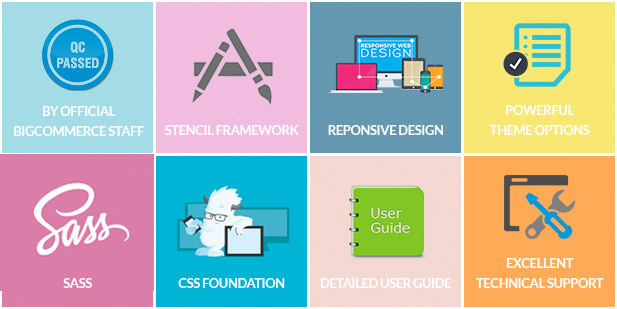 Our themes covers the high level of customizing within unlimited color variations options throughout the theme including background color, border colors, hover, loading indicator colors, typography styles, font sizes, button color, icon color, header, footer banners and beyond. Outstanding Support: We understand that crafting great themes and selling themes is not enough. Providing an awesome support would more than its actual value. Our dedicated customer services is available to assist you 24 hours a day, seven days a week to sort out the potential bugs and theme updates. 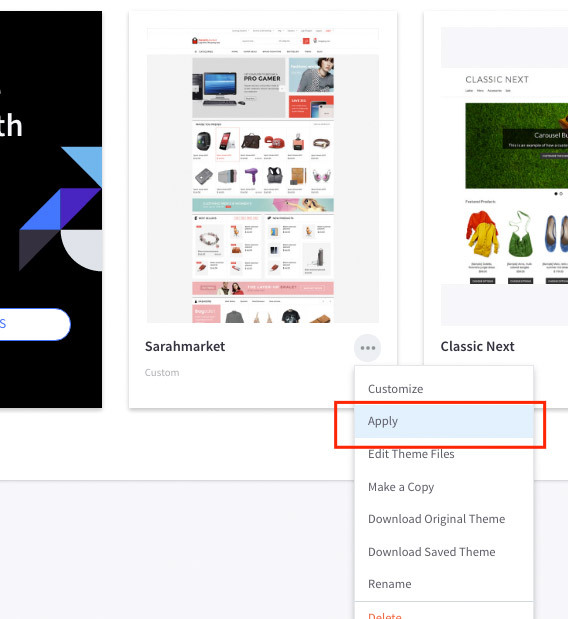 How to install our BigCommerce themes within a minute? Login to the BigCommerce Administration Panels. In your BigCommerce dashboard, go to Storefront Design > My Themes. Click on the Upload Theme button. From the popup window, click on Select theme from your computer to browse your theme's file and select the .zip extension file (eg: Modez-x.x.x.zip). Once the .zip file is uploaded, the theme installation is done. When the installation is completed, you'll see a theme preview activated under My Themes. Click the ... icon to see the drop-down, then click Apply. A popup window shows you which theme style to activate. Select the desired style and click Continue to apply your update. You will be returned to the Store Design main screen with a message that the theme was successfully installed.